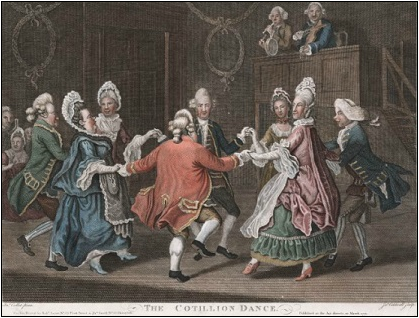 “The Cotillion Dance” by Caldwall. 1771. Courtesy The Lewis Walpole Library, Yale University. I am reading Georgette Heyer’s Cotillion right now…I’m about half way through, and it occurred to me the other night at this midpoint that I’m not quite sure who Kitty is going to end up with. Note: I am NOT finished the book, so please don’t be a spoil-sport and spoil it for me! I’m happy to talk more about the exciting conclusion when I wrap it up! At the outset, I believed it to be Jack Westruthers, whom Kitty has been in love with for an age, but who she now “hates” (I think that should be in quotation marks – after all, she’s wanted to slap him twice so far) because he’s always ignored her. However, Jack is a bit of a cad. That might be an understatement. Or an overstatement. I’m not sure yet whether he’s playing Kitty or his cousins Hugh or Freddy. And Freddy…lovely Mr. Standen, future Viscount Legerwood, Kitty’s fiancé-for-pretend (gee, this sounds familiar), who originally seemed the stuck-up town beau, is turning out to be quite a charming guy, even if he is suspicious of Kitty’s cousin, the chevalier. What I find so interesting at this juncture is I have no idea where Heyer is going with this story. She is a master at giving away nothing. She throws curve balls left and right, taking you for an unpredictable-yet-satisfying-in-the-end ride, but all’s you can do along the way is duck and hang on tight, anxious for more. There are many stories I’ve read where, from the get-go, I could provide a map of how the story will happen. With romances and mysteries in particular, you know you’re going to get an HEA or a crime solved. What makes the stories more enjoyable to the reader is knowing they’re going to get from point A to point Z, but not that they’re going to detour through P, K, and R, and skip H and O completely. You’ve heard us say this over and over on this blog: when things get predictable, bring in a dog or throw a rock. I think I need to do a bit of that curve-ball-detour-dog-rock thing in my own book. That’s not to say there aren’t some things in Three Proposals that are surprising. I think there are. But I bet there are many places where I’ve dropped hints by the dump truck load that I could scale back to a few pebbles (made even better if you only notice them on a subsequent read). I’d share some examples, but then I’d be giving away the book. Can’t be doing that yet! I’m dying to finish Cotillion. I want to see who Kitty chooses. And how. And why. And what happens to everyone else (especially Dolph…sweet, simple Dolph). In the meantime, I’m going to think of ways to scale back the plot advertisements in my own book. Speaking of my book, it’s time for a schedule update! Last week, I tapped out my schedule to get stuff done. Reality Check: kids are starting (new!) school, I still have PTA stuff to finish up, we’re having part of our house painted, and I have lots of doctor appointments that I’ve been putting off. So here’s what actually happened: I have completed ONE critique (on Monday, no less). The kids have started school (that’s going well…thank goodness). The home painting project ended up being way more time than I anticipated, and I spent nearly all of one day going from doctor office to doctor office. Analysis: I need to break my timelines down into smaller chunks. What am I doing THIS day and THIS day, and for how long? I also need to get up earlier and try to get completely ready for my day before I take the kids to school. This means when I get back I’m ready to write. Or critique. Whatever. As much as I don’t want to, I’m going to limit myself to one hour for each remaining critique. I have to, or I’ll never finish. I’m not revising my plan yet (even though I’m behind). I have a long week ahead of me. We’ll see where I am by Thursday. This entry was posted in Journey, Mystery, Planning, Plots and tagged #amwriting, backstory, cotillion, discovery, eight ladies writing, fiction writing, Georgette Heyer, Justine Covington, newbie writer, plotting, regencies, regency romance, romance writing, writing, writing process, writing tips, writing tricks. Bookmark the permalink. No spoilers here, Justine, except to say lucky you, reading Cotillion for the first time. It’s one of my absolute favorites and I think it may be Heyer’s most brilliant book. And of course, a cotillion is a dance for four couples which involves changing partners, so trying to figure out who will end up with whom when the music stops is all part of the fun. Heyer does that a lot — it took me a few books to get into Heyer, but now I like her quite a bit. One of the reasons is that she’s an amazing plotter — and she somehow makes the most screwball events seem perfectly reasonable. I think it’s that measured voice she uses . . . . Very authoritative, and often omniscient. I just finished Venetia (that’s a straight one hero/one heroine romance), and then proceeded to Bath Tangle. I swear, Serena has about five potential suitors at a few points (well, more, but five who could be the HEA guy). Even though it was a re-read, I wasn’t quite sure until quite near the end who she was going to end up with. The blurbs on the book gave that one away, though. (-: I like Cotilliion a lot. Of course, the weaving back and forth and changing of partners makes that a perfect title for that book — and maybe the perfect title for a few more Heyer novels! She certainly knows how to make her characters dance. I love her plotting, and most of all I love it when she wraps up the entire story in one brilliant scene with all the major characters present and doing their thing. Unknown Ajax is my absolute fave for this, but she does it often, and makes it look easy. I’ve tried it and…argh. You’ve piqued my interest, Justine! I haven’t read Cotillion for many years. I believe it’s time for a re-read! Funnily enough, I actually dislike it when I don’t know who the hero is from pretty early on – I like to know who to root for – and when I first read Cotillion, I didn’t enjoy it that much for that reason. When I re-read it, (now knowing who to root for!) I loved it. This is one of the Heyer’s where you don’t know who to root for and I do love it. It’s not my favorite Heyer, That would be a dead heat between The Grand Sophy, Arabella, Regency Buck and These Old Shades. Your place on your to-do list sounds much like mine and I feel better reading yours. Thank you!